Pollyanna - just one of thousands of kittens who will be born to homeless cats this year. Her poor little mother was found deceased - we don't know how or why. Luckily, the person who scooped up Pollyanna got in touch with someone who had advertised having a lactating mother cat. That mom's kittens had perished during an emergency c-section. Pollyanna thrived with her adoptive mom but mom's work didn't end there. 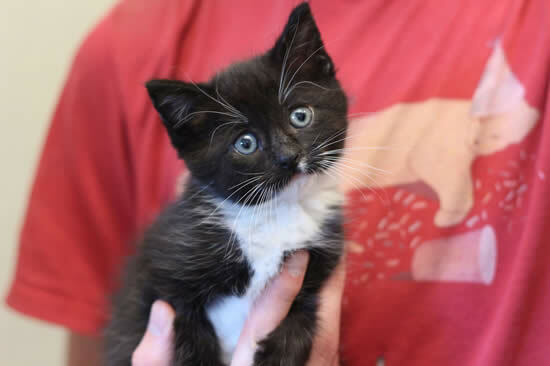 Five more, much younger, orphaned kittens desperately needed her and so the decision was made to move Pollyanna to another foster home so that the tinier kittens would have enough mother's milk. At that point, Pollyanna was eight weeks old and eating food on her own. She didn't mind being moved. Now she had a human servant all to herself - her own personal play-thing - 24/7! There is already an approved adoptive home waiting for Pollyanna. Once they arrive home from holidays, she can begin their training as her personal assistant and human mattress.